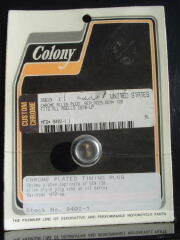 Quality duplicate of allen style plug used on all Harley Davidson 1970-up. Has a 5/8" X 18 thread pitch. Replaces OEM # 720. Colony Stock #'s 9402-1 and 9403-1.